The European Parliament has adopted a tough resolution on Russia, calling on the European Union to ditch Russia as a strategic partner. Russian experts say the resolution is connected to the EU summit late June, which is expected to renew sanctions imposed over the Kremlin's handling of the Ukrainian crisis. 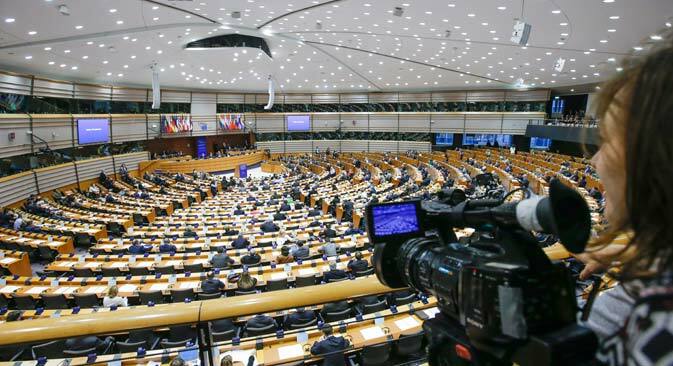 On June 10 the European Parliament passed a resolution governing the status of relations between Russia and the EU by 494 votes to 135 with 69 abstentions. The move failed to win the support of right wing parties, including Britain's UKIP and France's National Front, as well as members of some left-wing groups. The resolution criticizes Russia for violation of democratic principles, fundamental values and international law, and more than once refers to the “illegal annexation of Crimea.” It highlights aspects of the Kremlin's domestic and foreign policies from “violence and harassment against LGBT people” to actions by Russian military aircraft that jeopardize “the safety of civilian flights.” MEPs urged the EU to abandon the strategic partnership with Russia and draft a soft-power contingency plan to counter the policies of the Russian Federation, which MEPs find aggressive. Russian experts differ over how influential the resolution may be in changing EU policy towards Moscow. “The EP's resolution is of a purely declaratory nature; [EU] institutions are in no way obliged to react to it," he said. The resolution may be part of a EU backlash against a controversial Russian "blacklist" of several European politicians, as well as the upcoming summit of EU leaders, which is expected to extend anti-Russian sanctions. Andrei Suzdaltsev, a political scientist and professor of economics at the Higher School of Economics, also links the EP's step with the EU summit, to be held June 25-26. He believes that it is part of a European campaign to pressure Russia. As early as May 5 the EP was calling for tougher sanctions against Russia, he adds. But he thinks the resolution may find a sympathetic response, which despite its non-binding status could eventually lead to the EU ditching the policy of a strategic partnership with Moscow. Entin disagrees, stressing that the concept of a “strategic partnership” between Russia and the EU is an abstract one, and the title of “strategic partner” does not mean anything in particular, while relations between Russia and the EU will "still be of a special nature." Both experts agree that the resolution reflects a determination by the EU to further toughen sanctions against Russia, suggesting its adoption demonstrates a unity not only between countries but also political forces in the EU. As Entin points out, the fact that the resolution was approved by an overwhelming majority and supported by major political parties indicates that the positions of right wing and left wing forces on Russia coincide. "Only the extreme forces acted as Russia's allies – either the extreme left or the extreme right – which do not have serious political weight in the EU," Entin said. The resolution also criticizes Russian policy on European political parties. Moscow, the document says, provides “support for and financing of radical and extremist parties in EU Member States.” MEPs recommended the European Commission to come up with a mechanism “for the collection, monitoring and reporting” of financial, political or technical assistance provided by Russia to European political parties and other organizations. According to Suzdaltsev, this is a clear example of double standards, since the same MEPs strongly criticize Moscow for its law on “foreign agents,” which was designed to limit the ability of foreign countries to interfere in the internal political affairs of the Russian Federation. In addition to creating a mechanism for monitoring Russian support for European political parties, MEPs propose that the EU boosts funding for projects designed to counter “Russian propaganda and misinformation within the EU and abroad” and those that support civil society in Russia.